Cut 10 spring roll sheets in half diagonally so you end up with 20 triangles. Keep them in their container until ready for use. Pat dry the shrimp. Using a knife, make a few nicks on the inside of the shrimp. This will help them to lay straight when you roll. Slightly Salt and Pepper the shrimp. Lightly Brush both sides of the shrimp in the sweet and sour sauce and let them sit 10 minutes. Lay the shrimp with the tail towards you on the spring roll triangle. Cover the shrimp with the right corner and roll tightly to the center, fold down the top corner and continue to roll. Dip your finger in water and lightly wet the third corner to seal the roll. 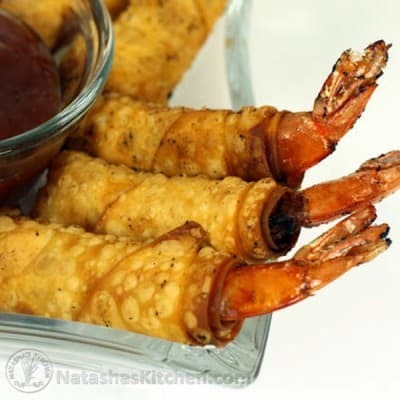 Keep finished shrimp under a damp towel to keep from drying out, or put them in oil right away. Fill saute pan with 1 inch canola oil and heat on medium high. Once the oil is hot, place the shrimp in a couple at a time (don't put in too many or the oil will cool down). Fry until golden brown (about 3 minutes). Serve with Sweet and sour sauce for dipping. Roll the shrimp tightly to keep oil out of the center. You can use other sauces such as teriyaki sauce to change-up the flavor of the shrimp.